The Calgary Stampede is in full swing. I set the PVR to record everything before it started and prepared to stay up late watching each go around. The first recording was of the parade. Although I do not often watch parades, live or otherwise, I did this time. The Calgary Stampede parade, then the stampede itself triggered some interesting memories . . . of rodeo, of my childhood and how the two connected. After Dad married, he still competed - with his family in tow. Although I don't remember much about the first rodeos I attended with my parents (starting when I was a baby), I recall later ones and the fun I had in and out of the rodeo arena! Clearwater Lake Rodeo - My black gelding, Rocky, at twenty years old, won enough money in the Barrel Racing and Pole Bending to buy me a transistor radio! I bought a plaque for the radio with "In memory of Rocky" engraved on it. I still have the plaque. 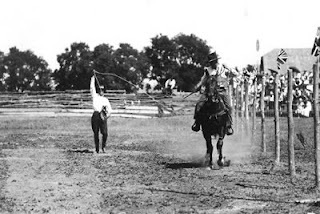 Jackfish Lake Rodeo - Dad was trick roping at this rodeo and I was riding for his horse catches (a crowd-pleasing trickroping act whereby Dad would perform some fancy rope tricks, then, as I galloped by, flip the rope around my horse - either both front feet or the whole horse.) 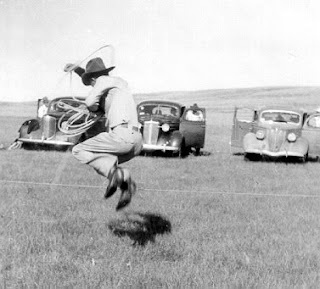 The photo below was taken in Dauphin, Manitoba in 1936 of Dad performing a horse catch. I do not know who the rider is) What I remember most, though, about Jackfish Rodeo is dancing under the stars with a calf roper (that shall be unnamed!) to the "Blue Danube Waltz" ('Blue were your eyes; blue were the skies; just like the blue dress you wore.' So romantic...). I was 15 years old, chaperoned by my parents and totally enamoured. Go figure... I still have the card and note he sentthe following Christmas. "I'll be up to see you one of these days," he writes. ". . . Don, Jim and I went down to Montana for 3 weeks . . . went to 12 rodeos and each of us placed in each one, but we spent nearly as much as we won. I got back to barebacking two weeks after Jackfish and then bucked off a saddle bronc about a month ago and broke my right arm." Such is rodeo life. I wonder how my life would have changed had he showed up at Clearwater Lake rodeo instead of going south. I never saw him or heard from him again. Herbert Rodeo - I brought my barrel racing horse to this rodeo, but I remember most hanging out with a very good looking cowboy (also unnamed!) after the rodeo. A stagecoach (There were a couple of stage coaches in the Calgary Stampede Parade) was parked on a hill by the arena and, on his suggestion, we rolled it down the hill - with me in it! It was a harmless prank but, for me, a huge step out of my safe, "don't ever break the law" way of growing up. I was pretty worried we would get caught. (We didn't.) On the same night, we dashed to town on back roads just for the fun of it, and picked up a hitch hiker. I thought my cowboy friend was crazy (and out of character!) to pick him up, but he had a plan. "We'll put him in the back," he said. "The back" was the box of his truck complete with stock racks in which he had hauled his horse to the rodeo. Then he drove madly down the side roads with straw and ??? flying everywhere. When we got to town, the hitchhiker, wind-blown, straw-decorated hair and all, staggered away without a thank you. Steers for the steer wrestling at Calgary Stampede are supplied by Doug Wilkinson. I believe Dad bought Rocky from his father! Also, Doug won a CCA Championship the same year I won the CCA Barrel Racing Championship. I believe I have only attended Calgary Stampede twice. The first time I was twelve. 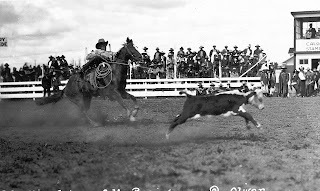 I remember two things - my parents discovered I need glasses because I couldn't read the numbers on the chutes and, after watching the chuckwagon races I wanted to become an outrider! The second time I was eight months pregnant with my second child - 45 years ago! I think it's time I went back. I'm aiming for the 100th anniversary of the stampede in 2012.